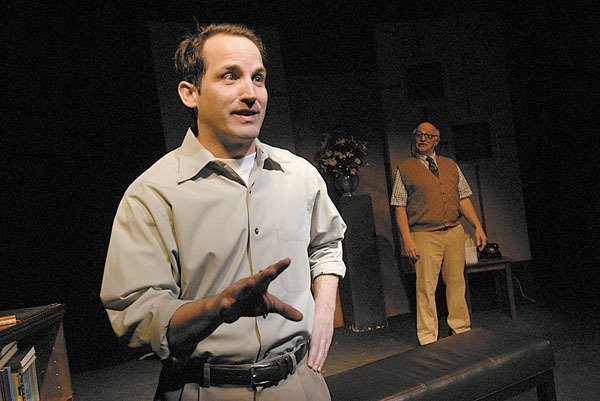 BRECKENIDGE ” When director Wendy Moore invited Summit High School grad Jon Whitfield to play Mitch in the two-man show, “Tuesdays with Morrie,” he couldn’t refuse ” even though he lives hundreds of miles away. “I thought to myself: ‘This is an incredible opportunity,’ and I figured out a way to do it,” Whitfield said. A long-time Backstage Theatre actor and Summit local for 20 years, Whitfield moved away almost a decade ago but always hoped that he’d get another crack at the stage. He now travels from his home in Austin, Texas, to Breckenridge to participate in the five-week-long show. “Jon pretty much wins the award for the furthest commute for a long-run show,” said Chris Willard, artistic director for the Backstage Theatre. He’s volunteering both his time and flight costs to participate in the production. Colorado Mountain Express is providing his shuttle to and from Denver through a trade with the Backstage Theatre, and he’s staying with high school friends each weekend. Planning around work was easy once Whitfield knew his schedule. His big concern was rehearsing enough, but it all worked out. He flew into Glenwood to practice with Wendy and Bob Moore (who plays Morrie) for three days in October, three days in November and six full days prior to opening day. Wendy Moore, former artistic director for Backstage Theatre, was Whitfield’s high school drama teacher, and Bob Moore is a long-time friend and mentor to Whitfield. Whitfield became involved with Backstage Theatre while still attending Colorado College. He traveled back and forth from Colorado Springs for a Backstage production in 1990 and returned to Summit County full-time to act with the theater from 1992-99. Whitfield last acted in a show with Bob Moore in 1999. He always wanted to work with Bob Moore again, and accepting the role of Mitch allowed him to wave off 10 years of dust and flex his acting muscles. “When I got the script, I was like ‘Oh my god, this is incredible,'” Whitfield said. “Tuesdays with Morrie” is about two people who once had an incredible relationship and it was put on the shelf, he said. Years later they came together and reignited the relationship. Whitfield parallels the relationship between Mitch and Morrie with his own friendship with Bob Moore. It’s appealing for people to travel to Breckenridge for work with the Backstage because of all the other recreation activities offered in the area, Willard said. The theater also has a laid-back vibe and good resources. “We’re all good friends and a broad network across the country,” Willard added. The Backstage is throwing its annual fundraiser, “The Bash,” in April. Many long-time residents who have now moved away will return for a one-night only variety show that raises funds for the theatre’s operating expenses. Expected participants include Suzanne Pedersen (now living in Pennsylvania), Linda Otto (now living in Oregon) and Nancy Feely (who’s working in Jordan). Whitfield will be emcee the event.